In the 1970s I used to attend an annual wargames show, Warfare Through The Ages. 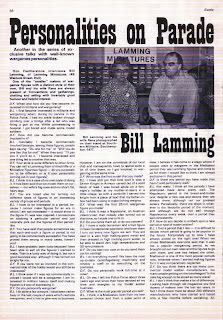 The highlight among the traders for me was always Bill Lamming's stand. With early multipart figures, I liked his Romans a lot, and especially his Medieval range. His Medieval Campaign rules were inspirational - I remember he produced tiny models of medieval cogs to handle the naval side of these. Unfortunately, this was after his Napoleonics went "heroic" in scale - I much prefer the first versions now. Lamming figures are usually easily recognisable through their "Easter Island" faces. I hope to provide some more information on the figures soon. His Napoleonic artillery models were also very highly regarded. I'm not quite sure whether these were also upscaled from 20mm to 25mm. I have some of the later models, but I'm not sure if there were earlier, smaller versions. If so, they would be second only to Hinchliffe 20mm equipment in my view. Lamming also made the only personality figure I am aware of for the Duke of York. The earlier Napoleonic cavalry range is pretty well catalogued and illustrated on Ron Marshall's Lazy Limey's Wargaming Place. Don Featherstone conducted a series of interviews with luminaries for Battle magazine in 1977 and 1978, under the banner Personalities on Parade. 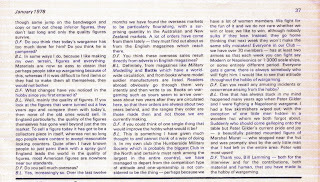 I have posted the one with Neville Dickinson of Miniature Figurines over on the Lone S Ranger and Doug Crowther has posted the Peter Gilder one on his blog, Unfashionably Shiny. I am posting the one for Bill Lamming here, and will also post it with others (Dickinson, Gilder, and George Gush), over on Vintage Wargaming. Lamming's miniatures did have a certain charm didn't they. I had a lot of his 20mm WW2 figures - a tad chunky but very consistent in quality and the separate weapons were superb. I remember in particular a superb prone bren gunner. Bill popped up briefly on TMP last year - the rights and moulds to his ranges had been returned to him after B&B was sold to Mac Warren. It would be nice to get some 'new' Lamming figs but i've no idea how to get in touch with him now.